The Catholic newspaper for the Diocese of Covington, Ky. 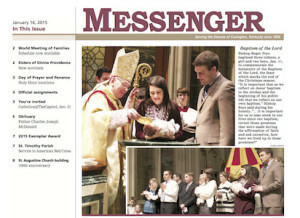 The Messenger is published weekly August through May and every other week in the months of June and July. For the latest edition of the Messenger. Advertisers can now pay their accounts, and readers their novenas, online using our new safe and secure payment partner — Vanco. Advertisers who regularly appear in the Messenger can set up an account for quick and safe payment of invoices. Single-use advertisers can make a one-time payment for a novena using the word “Novena” in the “Invoice” section. There will be a Holy Hour on the third Thursday of every month, at the Cathedral Basilica of the Assumption, Covington, 3–4 p.m., to pray for victims of sexual abuse by clergy and to pray for the Church. 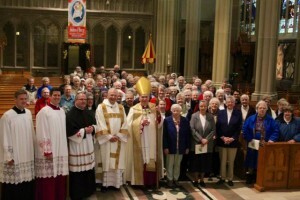 All priests of the diocese will be in attendance; the lay faithful are invited to join. The Blessed Sacrament will be exposed, concluding with the Chaplet of Divine Mercy and benediction. The sacrament of penance will be available during the Holy Hour. Next Holy Hour: Thursday, May 16. Kentucky Symphony Orchestra, “Viva Vivaldi,” indoor/outdoor concert, at the Cathedral Basilica of the Assumption, Covington, May 11, 8 p.m., featuring Vivaldi’s “Gloria” and “The Four Seasons.” Features technical, visual applications experienced at events like Lumenocity and Blink. Tickets at kyso.org or 431-6216. Pictures of churches or any Northern Kentucky landmark (without recognizable people in the shot) to be featured in the show can be submitted to [email protected] before April 22. Emmet Cahill concert at Mother of God Church, Covington, April 24, meet-and-greet at 5:45 p.m.; concert 7:10 p.m. Tickets: EmmetCahill.com. Sarah’s Hope & Abraham’s Promise, a program for couples struggling with infertility and pregnancy loss, Mass for Infertility Awareness, April 25, 6:30 p.m., at the Cathedral Basilica of the Assumption, Covington; reception to follow in Bishop Howard Memorial Auditorium. Holy Cross District High School, annual Spring Choral Concert, April 25, 7–8 p.m., at Notre Dame Academy, Park Hills. This year’s concert features a variety of pop songs. Free and open to the public. Care Net Annual Banquet, May 9, Receptions, Erlanger, featuring founder of the 40 Days for Life movement, David Bereit. RSVP to [email protected] or 431-9178. Cross the Bridge for Life, June 2, Festival Grounds, Newport (behind Newport on the Levee). Join hundreds of participants for this peaceful, prayerful presence to advocate for the sanctity of human life. This is a c family-friendly event. Information, 392-1500. Our online photo albums feature many unpublished photos from events covered in the Messenger. The photos are available to download for personal use. News media and other publications are asked to contact the Messenger for permission before using. The Messenger subscribes to Catholic News Service, a highly respected news gathering operation serving 8 million people around the world. CNS makes available to us national and international reports. CNS was established in 1920 by the United States Conference of Catholic Bishops but is editorially independent and financially self-sustaining. Missed an edition? Archive Messengers are here. Obituary – Msgr. Allen Meier, P.A. School choice rally in Frankfort, Ky.
Obituary – Sister Mary Paul Luongo, C.P.